How do I enter the licence number? The licence number is entered on the device properties. Start the ERP-Scale configuration utility and open the properties page for the SAP-Scale server. *Note: The licence password is selected when purchasing licences. 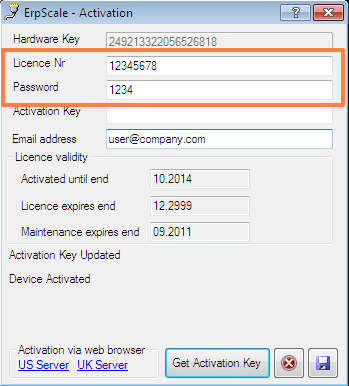 Once the licence number and password have been entered, click “Get activation Key” to activate the licence. Then click “Save” to complete the activation.